Original owner Margaret Jungling and her living room and front exterior. 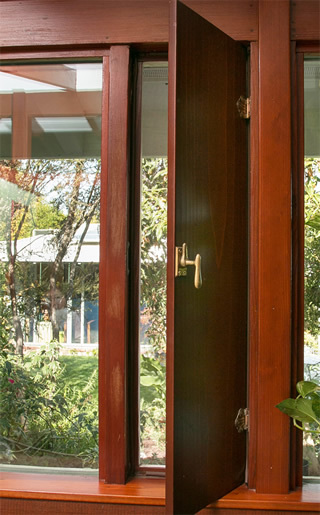 One of the unique wooden shutters common to several Gavello models. Pierino, "a handsome, curly headed Piedmontese from Turin," in the words of historian Jerry Flamm, became one of San Francisco's most successful and colorful restaurateurs. "The North Beach moneybags," as the Chronicle called him in 1952, had run the most popular Italian restaurant in town since the late 1930s, dishing out immense salads, soups, raviolis, and meat courses, and featuring four or five performances a night, "carefully chosen so as not to offend anyone." Pierino's skills extended beyond ravioli. In his 1991 talk, Elmer Gavello said his father saw the future of Santa Clara Valley when it was still farmland and acted on it, buying the old Ellis Farm in 1945. "It's going to be subdivision land," he said. He suggested that Elmer do the same. "He said, 'Come up here and buy anything from San Francisco to San Jose on the El Camino. I don't care what it is.' I didn't listen to him. He was right." "I swear, he had a crystal ball." Elmer Gavello, who was 34 and had no experience building, knew about Eichler, who began his homebuilding career four years earlier in Sunnyvale. Gavello said he spoke to Joe Eichler about developing a tract on the former Ellis land, but Joe said no. 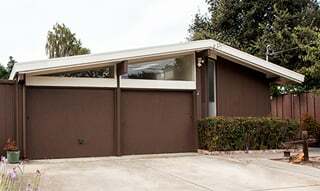 So Gavello did the next best thing, hiring Eichler's architects. After Gavello Glen, Elmer, who died in 1998 at age 80, did not stay in the homebuilding business, but turned his attention to San Francisco, in the area around the former Barbary Row-International Settlement. He helped transform part of the area into Jackson Square, bringing in fine furnishings, antiques, and interior designers. A small neighborhood of homes in Saratoga using the same or similar plans as in Gavello Glen was built by another developer, Elmer Gavello said in his video interview. The developer of those was "a man I made a deal with," Gavello said, adding that he has never seen the homes. Today, houses in Gavello Glen start at $1 million, and many go for $1.25 to $1.5 million. The large lots are a strong attraction, and that worries newcomer Carol Maa, Jean's daughter. Many of the younger people working for the area's tech companies, people who would most appreciate the homes' architecture, can't afford them, she says. "My concern is the people who can afford them are just looking at lot sizes."